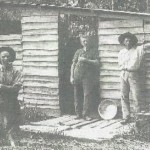 White settlement in Mena Creek has been traced back as far as 1890 when a base camp for the police was set up. 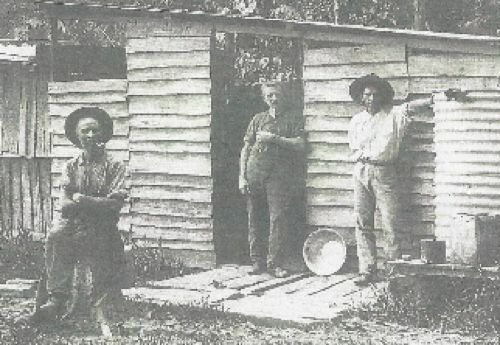 Henry Noone has been acknowledged as the first white settler as the photo circa 1912 shows him standing in the doorway of the first building in Mena Creek. Also in the photo are Alex Stirling and Jim Hing. Henry Noone was an advocate for the establishment of the South Johnstone Mill and Noone was one of the first sugar cane suppliers to the mill. Mena Creek’s busiest days are long gone. Back in the 1930′s the township supported a number of small stores, its own bakery, butcher, sawmill with various dairies operating as well as timber-getting and cane growing. 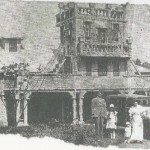 Now there is only the Mena Creek Hotel, the local store, a state school and the tourist attraction of Paronella Park left. Around 1920 Mena Creek’s name which was originally Stewart Creek, was changed because mail was misdirected to Stuart Creek in Townsville . The upper reach of Stewart Creek was officially renamed Mena Creek by the Surveyor-General in March 1954 after Henry Noone’s daughter Philomena ‘Mena’ Fallon). Noone obtained a lease and established a camp (c.1914) at the top of the falls, and for two years cleared the land and felled cedar. Noone, who had emigrated from Ireland in 1888, was a trained surveyor and also worked in various capacities, including as a timber-getter…. Noone regularly brought his family from Innisfail to Mena Creek to camp, picnic and swim. In early 1929, due to increasing interest from campers and visitors, Noone cleared an area along the southern bank of the creek and gave it to the local council for use as a picnic and recreation reserve (this area forms the reserve on the opposite bank of the creek to Paronella Park, and was gazetted in 1947 as a recreation reserve, in 1953 as a reserve for camping purposes, and then in 1976 as a reserve for Environmental Park under the control of Johnstone Shire Council). 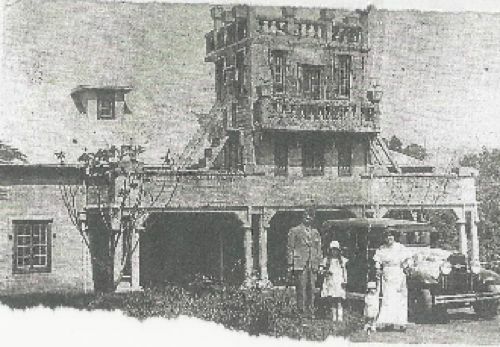 Noone opened the Mena Creek Hotel in 1929, and it was around this time that Jose Paronella visited the area and selected it as the perfect site for his ‘Spanish-style Castillo’ and commercial pleasure garden. At this time it was still a fairly isolated area with mill tramline and horses providing the main transport. The hotel has been gutted by fire twice in it’s history but today still retains the charm of an original country pub with many reminders of the old times for visitors to enjoy during their stay. Paronella Park, one of Innisfail’s best known landmarks, is located at Mena Creek with the castle which was officially opened in 1935 built on the edge of the magnificent Mena Creek Falls. Mena Creek State School was opened on March 15 1920 with a total of 12 pupils.